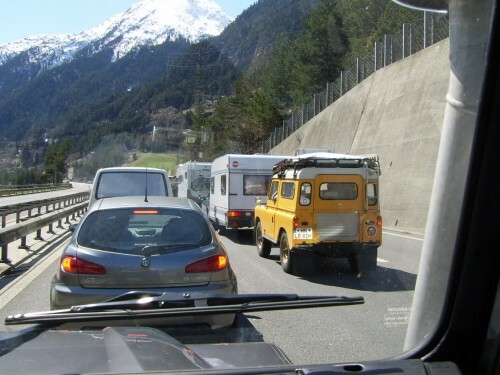 It is Easter and time to start our trial road trip from Darmstadt, Germany, to Locarno in Ticino, Switzerland, on the shores of beautiful Lago Maggiore for the Easter weekend. We had the idea of visiting Locarno after reading about the Maggia Valley and its amazing climbing areas in a new German rock climbing magazine called “Climb”. Another major criteria was the distance: roughly 600km from our home base and therefore very close to the distances we plan on traveling during the most stressful days during the summer road trip to Spain. When good Friday arrived we hit the car at 6am to get a head-start on the traffic. Surprisingly the roads where pretty much empty and we had a good drive down the A5 highway all the way into Switzerland. While looking for a gas station we decided to stay off the highway and go through the back-country, hoping we could take a pass road which wasn’t closed due to snow. The colors of the fields and streams, together with the grey of the rock and the blue of sky where amazing. We really couldn’t have hoped for better weather. 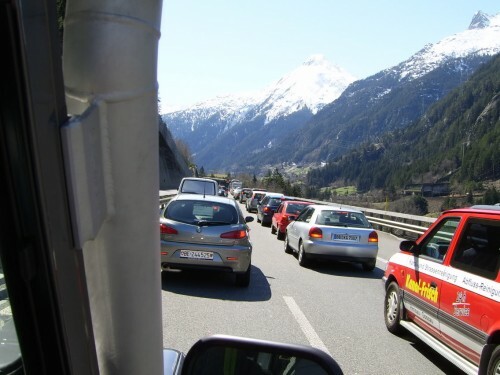 Heading into the St. Gothard tunnel we finally hit a bit of traffic – 90 minutes of stop and go. Our clutch leg was slowly going numb as the Defender’s clutch is quite hard to push after a while. But at least the weather was starting to warm up and there are definitely worse places to get caught in traffic than surrounded by the Swiss alps. During the traffic jam we came upon a group of three restored Series Land Rovers on their way to Tunisia for a two week trip through the desert. We chatted across the road with them for a few minutes and finally came up on the tunnel. A long, stinky and claustrophobic affair. The tunnel is 17km long and you can definitely feel the pressure, heat and exhaust fumes hitting you as you go through there – after all, the Defender doesn’t have a really high tech ventilation system. As we headed into Locarno we where greeted by what we had been looking for: Warm weather, Mediteranean feel and amazing rocks to climb all around. All in all the drive was not too bad and going this distance during the road trip should definitely not be a problem. All in all it took us 8 hours for the entire trip, but that included breakfast breaks and a whole bunch of bathroom breaks as well.